Sistemic Ltd. and RoosterBio Inc. announced today that they have entered into a commercial collaboration agreement and signed a memorandum of understanding whereby both companies will combine their technologies and work together towards advancing the field of mesenchymal stem/stromal cell (MSC) regenerative technology. 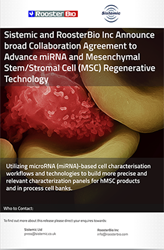 RoosterBio and Sistemic will collaborate on utilizing microRNA (miRNA)-based cell characterisation workflows and technologies to build more precise and relevant characterization panels for hMSC products and in process cell banks. The collaboration furthers the identification of microRNA (miRNA) biomarkers across a wide range of donors predictive of hMSC performance based on a matrix of biological functions and outcomes of interest. Both companies envisage offering their customers’ access to the each other's technology platforms to enhance the quality, performance, and therapeutic knowledge of MSC technology. The eventual goal of the collaboration will be to erase the functional variability that is inherent in today’s MSC products and drive the evolution of stem cells from a science to a robust technology. RoosterBio is a privately held biofabrication technology and products company focused on accelerating the development of a sustainable regenerative medicine industry, one customer at a time. RoosterBio’s products are high volume, affordable, and well-characterized adult human mesenchymal stem/stromal cells (hMSCs) paired with highly engineered media systems. RoosterBio has simplified and standardized how stem cells are purchased, expanded, and used in development, leading to marked time and costs savings for customers. RoosterBio’s innovative products are ushering in a new era of productivity and standardization into the field, where researchers spend newly found time and money performing more high-value experiments, accelerating the road to discovery in Regenerative Medicine. For more information on RoosterBio and adult stem cells, you can visit http://www.roosterbio.com, follow on twitter (@RoosterBio), or read the blog “Democratizing Cell Technologies” (http://www.roosterbio.blogspot.com).